Since everyone in the course is on a different schedule, it’s not possible to set up peer review activities for the projects. Instead, you will work in writing groups to share whatever you have and help provide some accountability for one another. Contact information that group members can use to contact one another outside class, if necessary. Group responsibilities (division of labor) for the project. For instance, do you want a leader? Who is responsible for making sure work summaries are posted? Responsibilities may evolve as the group works. Communication policies that account for how the group will deal with scheduling, questions, and absences. General plan for what will happen during each session (see the next section). Status/progress reports on what you are doing/have done since the last meeting. Project plan and/or schedule updates. Planning documents you have created (e.g., mock-ups, storyboards, outlines, scripts). Prototypes and rough drafts of your projects. Provide supportive feedback and advice, like that shown in the No One Writes Alone video. Work together to solve challenges. 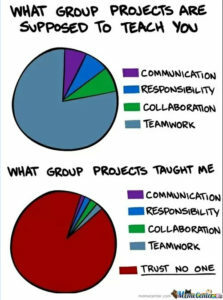 Collaborate on projects (be sure to credit your helpers). Work independently, connecting with one another as necessary. Tell me what you accomplished during the session. Let me know about any questions or unresolved challenges/problems. Attach or include any group activities (like your guidelines). Include anything that you want the entire group to have access to. For each session, you will have a Work Summary for your group, but you can also include individual messages for group members. For instance, if you wanted to share a link to the rough cut of your video, you can post it in the summary for that session.